Once described by US President Franklin D Roosevelt as “a dream of Nirvana… almost too good to be true” Easton Walled gardens is a romantic garden that has survived its fair share of adversity. This historic rural estate in the idyllic Lincolnshire countryside has been owned by the Cholmeley family for more than 400 years. 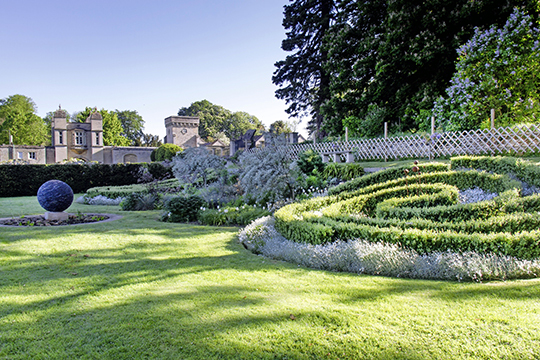 But, like so many of our grand country estates, Easton felt the impact of two world wars and by the end of the 20th century, the gardens were in such a parlous state they were placed on English Heritage’s ‘At Risk’ register. In Easton’s case the house and grounds were requisitioned by the military, but the soldiers billeted there showed little or no respect for the buildings, which suffered such extensive damage that the family never returned. In 1951 Easton Hall was demolished – the surviving stables, gatehouse and a handful of outbuildings are all that’s left of the original buildings – and the gardens were gradually consumed by self-sown trees, thickets of brambles and towering weeds. In 2001, spurred into action at the prospect of the gardens being lost forever, the new owner Lady Ursula Cholmeley, with no budget, a few willing friends and family and limited machinery, embarked on a revival of the 12 acres of gardens. As the undergrowth was cleared the original Tudor and Jacobean layout of the gardens was uncovered, as were carpets of snowdrops that, once uncovered and exposed to light, have now spread to cover the riverbanks. While much of the current layout follows the old Tudor design, Lady Cholmeley has incorporated contemporary ideas along with an overriding ethos that the gardens have to work in harmony with nature. Meadows and grasses feature strongly, not least because the garden lies on a limestone bedrock with barely any topsoil. Rather than fight against these conditions, Lady Cholmeley decided to encourage a rich diversity of meadow plants such as pasque flowers, scabious and cowslips. In spring the Woodland Walk is dominated by two fabulous old trees – a horse chestnut and a black walnut – and is filled with exquisite epimediums, violets and hellebores. The White Space is a traditional white planting scheme with a contemporary feel inspired by landscape designer Charles Jencks. Cosmic swirls are marked out with topiary box interplanted with white-flowered Cerastium tomentosum. Sweet peas were one of the first plants to be grown in the garden when the restoration began in 2001. Since then they’ve become a firm favourite and can be found growing en masse in the cutting garden, otherwise known as ‘The Pickery’: a space filled in summer with dahlias, cosmos, zinnias, rudbeckias and salvias. The gardening team trial new varieties of sweet pea every year, selecting the best to grow on a larger scale the following year. There’s a burgeoning orchard planted with local fruit cultivars and more unusual crops such as quince and greengages. The greenhouses and vegetable garden – long raised beds made from oak sleepers – brim with produce which keeps the café supplied with a delicious range of home-grown fruit and veg throughout summer and autumn. Roses are planted in meadows – an unusual way of growing this classic flower. Advised by David Austin Roses, a variety of cultivars have been planted in the long grass, which creates a spectacular sight as blowsy blooms float above a sea of bleached-blonde grasses. The terraced summer meadows cover a steep slope from the main garden down to the river. The flat sections are mown, but the slopes are left so that the grasses grow long creating an informal frothy appearance that contrasts with the formal flights of stone steps and topiary pyramids. Another quirky touch is the unexpected sight of life-size metal giraffes gazing out over the surrounding countryside. Open: Weds-Fri, Sun and Bank Holidays 11am-4pm until 28 Oct. Open for one week in February for snowdrops.